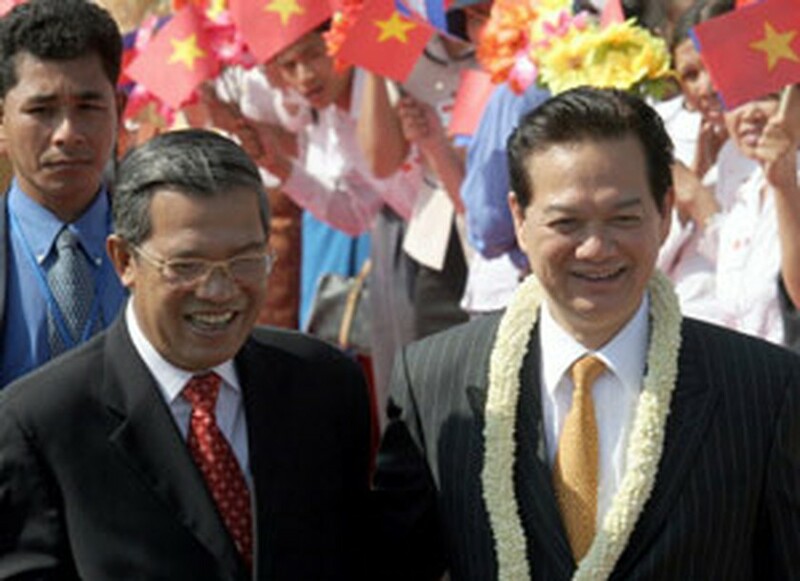 Cambodian Prime Minister Hun Sen (L) welcomes Vietnamese Prime Minister Nguyen Tan Dung (R) at Phnom Penh International airport, Dec. 18, 2006. Prime Minister Nguyen Tan Dung today begins official visits to neighboring countries Cambodia, Laos, and Thailand. The PM starts the trip by the visit in Cambodia on Dec. 18-19, then he visits Laos on Dec. 19-20, and Thailand on Dec. 20-21. The courtesy visits, coming at the invitation of his three counterparts, namely Cambodian PM Samdech Hunsen; Lao PM Buasone Bouphavanh and Thai PM Surayud Chulanont would help to confirm Vietnam's commitments to respecting and boosting cooperations with its neighbors. During his visit to Laos and Thailand, PM Dung will attend the inauguration of a friendship bridge between Thailand's Mucdahan and Laos' Savanakhet on Dec. 20.